IT'S SUNNY! Well at the time of writing this post it was anyway, who knows about tomorrow. So that means one thing, it's time for a beer and a burger. My main reason for wanting to make this was that I wanted to make a burger with avocado on top. A few weeks ago I couldn't stop eating avocados and just as I thought I'd gotten over it, my manager was also recently struck with this horrible affliction (not really, avocados are great). Seeing her eating them brought back my terrible avocado cravings and I can't stop eating them again. Anyway, I decided on a black bean burger and wanted to bring out the flavours you'd get in a lovely fresh batch of guac, so added lots of lime and chili. It's really tasty, refreshing and not too heavy (I ate a HUGE one) so perfect for the hot weather AND it's vegan... hooray! Chuck your onion and garlic in to a frying pan with a little oil and soften on a low heat for around 10 minutes, add the chili and heat through for a further few minutes. While the onions are softening mush the black beans up with a fork in a large bowl until they're nice an squished. Pop the slice of bread in to a food processor and turn it in to bread crumbs then add it, along with the onions, chili and garlic to the black beans and mix well. When the mixture is combined, divide it in to 2 or 4 balls and squish in to patties on a floured surface. Heat some oil in a frying pan and pop the burgers in, cook on a medium heat until nice and browned on both sides then transfer it to the burger bun. 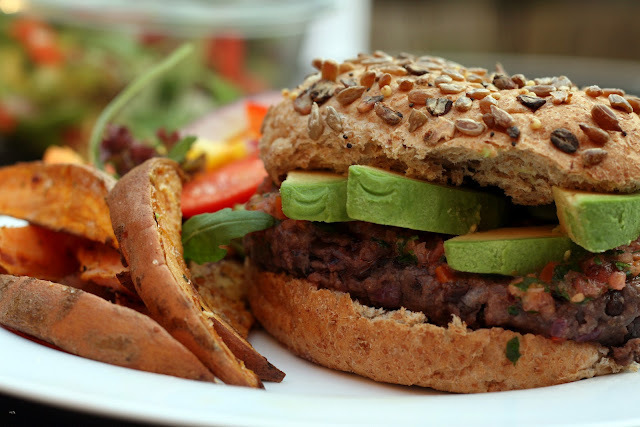 Top it with fresh salsa and sliced avocado, serve it up with some sweet potato wedges and salad and enjoy!